In a fast developing country like India much is being done for education and its advancement, but the potentials of creative arts are often overlooked, perhaps due to lack of trained personnel. This book provides a general guide to help those who want to conduct training courses in puppetry and creative drama or to use these techniques in education, social work, recreation, occupational therapy and audio-visual education for communicating ideas to both children and adults. 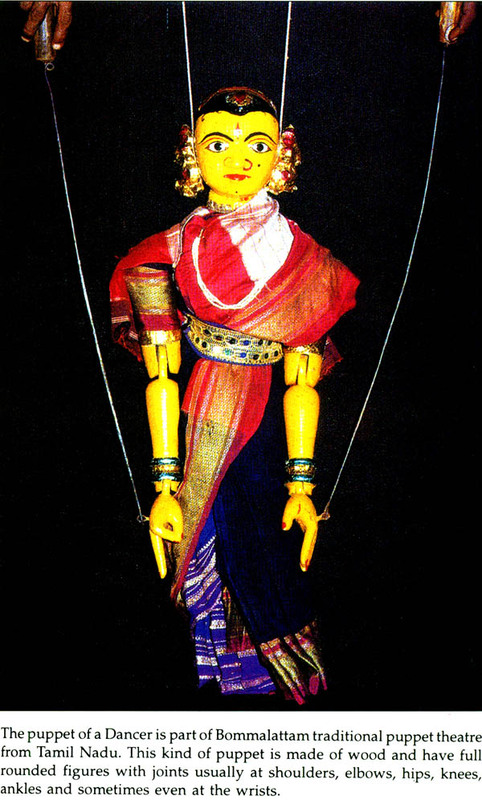 Mrs. Meher R. Contractor is a well-known authority on Puppetry. She has represented India at several International Puppetry Festivals and has conducted Teachers' Training Courses for Puppetry and Creative Arts. 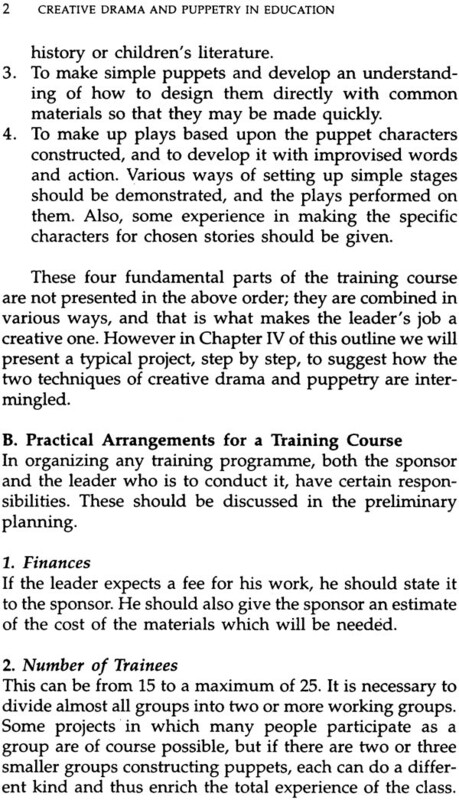 This outline is a general guide to help those who want to conduct training courses in puppetry and creative drama or to use these techniques in education, social work, recreation, occupational therapy, and audio-visual educa- tion for communicating ideas both to children and adults. The term creative means the capacity of the individual to use his imagination and carry out his ideas on his own responsibility. 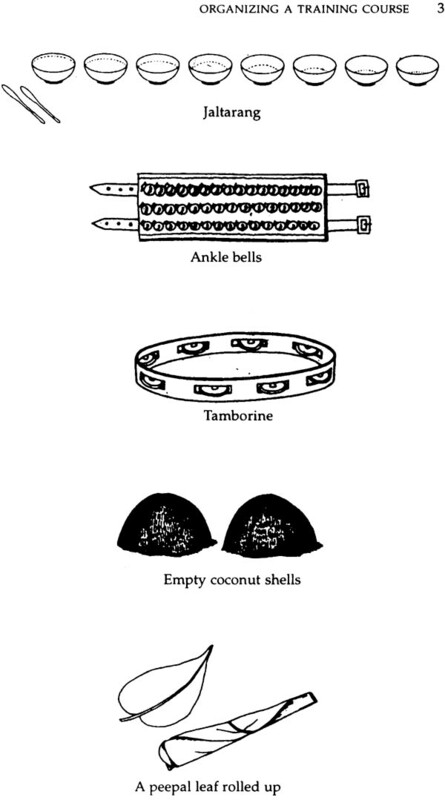 Many forms of art are now being used in education, but instruction in them is too often formal, and the student is set to copying, with little opportunity to express his own ideas and develop his own techniques. In contrast, art education may be creative, if it is designed to help the students to express their ideas in their own way. It is with the creative approach that this outline is con- cerned. Two techniques, puppetry and creative drama, are especially adaptable to educational work because they involve many arts. Creative drama can be used by itself anywhere, at any time, for it requires no equipment except space in which free movement can take place and a resourceful leader who has had some training. Puppetry unites craftsmanship and design with drama. 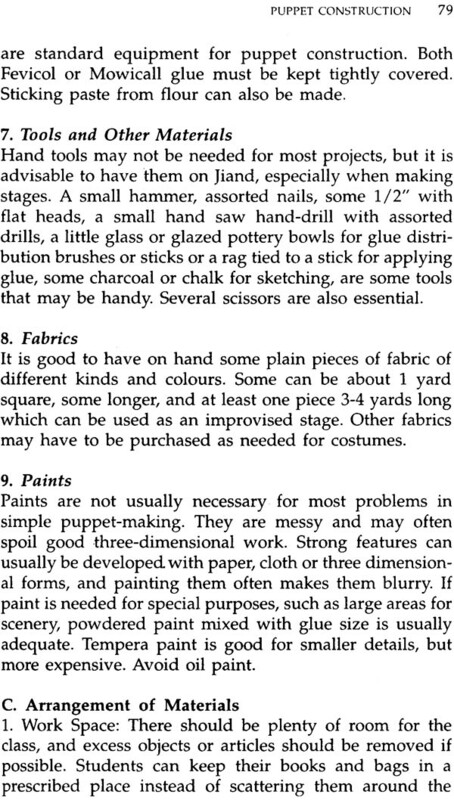 It is essen- tially a dramatic art, for puppets are made to be actors. 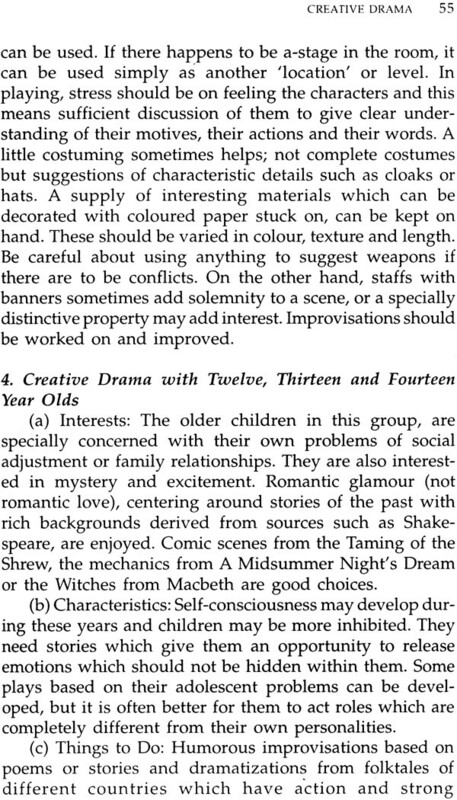 Some of the techniques of creative drama, such as rhyth- mic movement, pantomime and play making with impro- vised dialogue and action, should be combined with pup- petry in order to make it a practical and expressive art in education. In this fast developing country much is being done for education and its advancement, but the creative arts are often overlooked, perhaps due to the lack of specially trained personnel. The result is that the classroom provides . the modern child with a set curriculum designed primarily to enable him to pass his examinations. Thus his develop- ment is 'one-sided'. His imagination is rarely stimulated and he is given little opportunity for creative thinking. However, many educators realize the need for the teach- ing of the arts from the creative point of view and it is for them that this outline has been prepared. 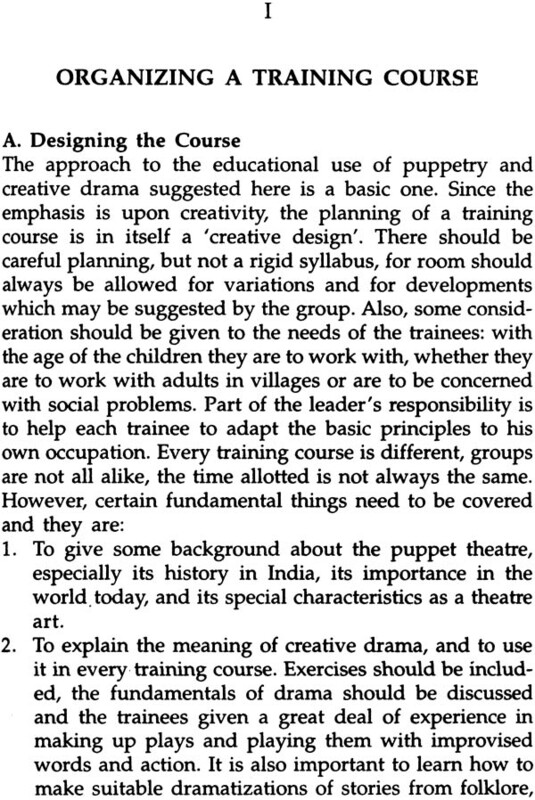 In India, neither puppetry nor creative drama has been used much, and we hope that the approach suggested in this Guide will help to start them off in the right direction in educating a child and to follow a course similar to which has been found rewarding in child development in England, the United States and other Western countries. There is danger that the arts may be used merely as a tool for teaching other subjects. In education, their first function is to develop imagination, initiative and individ- ual thinking. At the same time they lay a foundation for an appreciation of all the arts which are the cultural heritage of a nation. 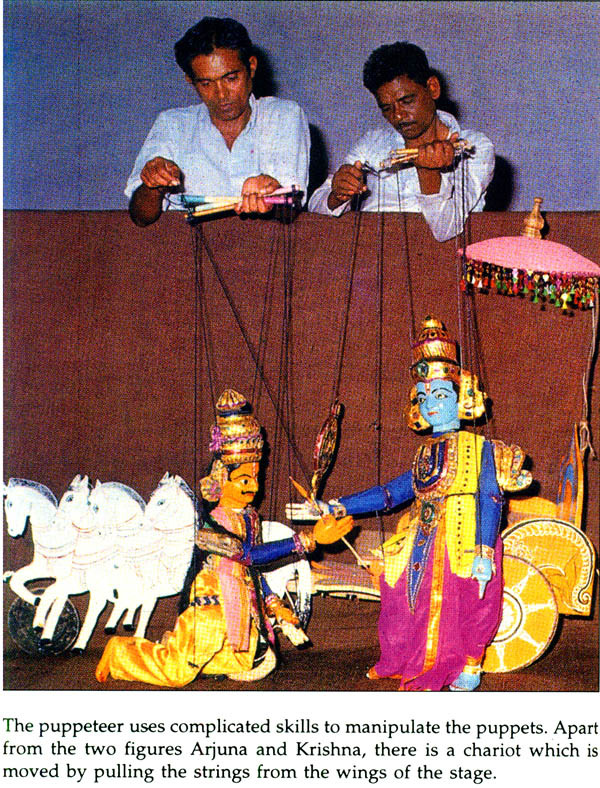 One leader in Indian education has pointed out that the use of puppetry and creative drama in schools has the important function of giving widespread partici- pation in dramatic art instead of the limited number who usually appear in formal plays. 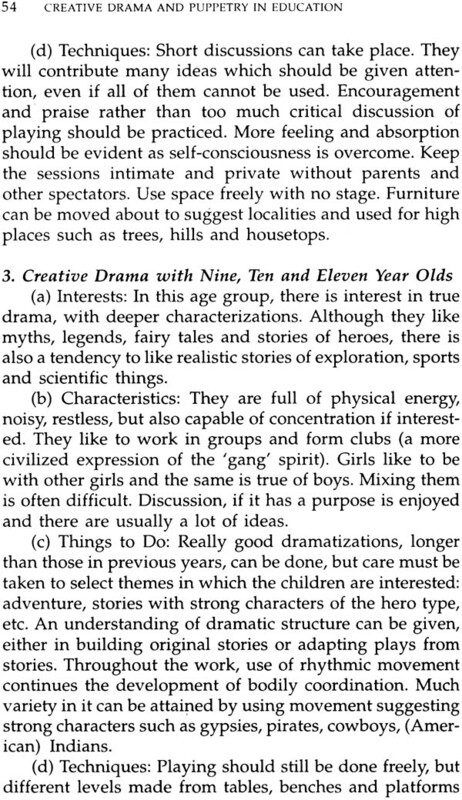 At the same time, creative drama is an excellent preparation for children to under- stand formal drama, and take part in it when they reach the upper secondary standards. This is exactly what the exponents of creative drama in the West believe. They feel that children below teenage should not perform on a stage in plays with learned lines, for these are adult practices which are not children's natural modes of expression. Instead, creative drama is based upon the child's dramatic play, in which he impersonates different people, animals, machines and a host of other things which he observes. He is completely absorbed in this play. He may change quickly from one character to another. He moves freely in the available space and feels no need for an audience. Creative drama is a personal, intimate group activity in which a sympathetic leader and the children work together to dramatize stories which are played freely with improvised dialogue and action. 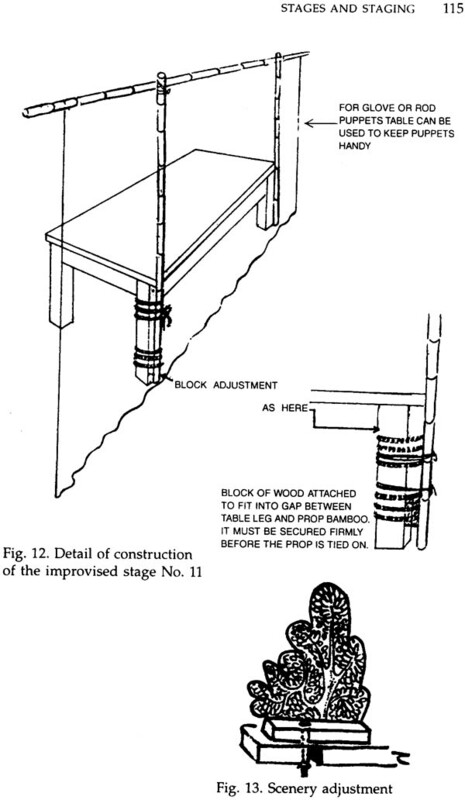 All parts of a room are used, instead of a stage. 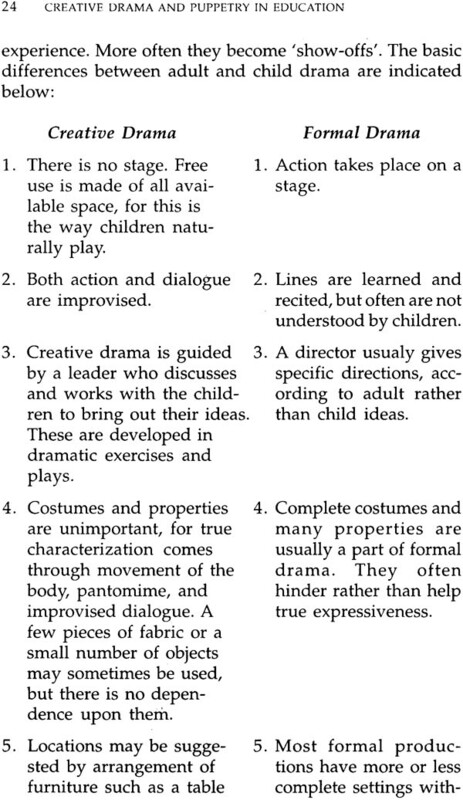 Every child has a chance to express his ideas, to help plan plays and to be the characters. There is constant changing of the 'cast' so that everybody knows all the action and understands all the characters. 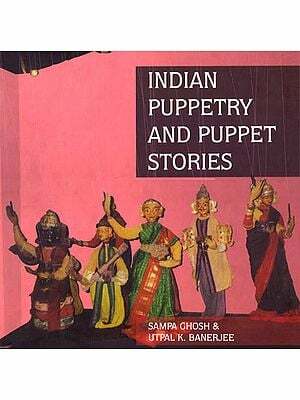 The objective of puppetry and creative drama in schools is not to produce plays for public performance but to give each individual opportunities for self expression which are related to the activities of the whole group. Performances are not completely ruled out, but they are not the primary objective. Another danger to the arts in an educational pro- gramme is that they are too often used for the glory of the school and the teacher, instead of being centered on the needs of the child. Competitions in painting, modelling and other arts with emphasis on prizes and exhibits create adult concepts, and destroy the real values to the child. He is not as interested, unless adult directed in the end- product of his work as in the doing of it. Adults are too prone to judge his work in terms of the way they see things, without understanding that the child has his own way of expressing what he sees and knows. The present trend does not give much opportunity to children to practice painting and related arts in his own way. 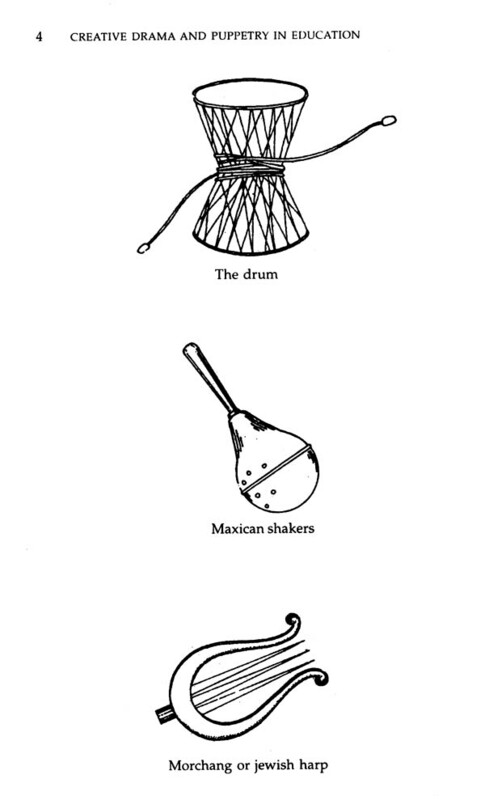 In music and dance, adult concepts are nearly always imposed. Children are trained .in dancing and produce ballets or operattas which are directed exactly as they would be with adults, and sometimes even taken on tour. There is little chance for any creativity, for the aim is to achieve the perfection necessary for public performance. In drama, the situation generally is the same. Recognition of the value of creative drama is made difficult because acceptance of its principles implies a new attitude on the part of teachers and administrators. To train children to perform on stage is one of the most cherished of school activities because they make an excellent display for functions. It is not generally realized that this is an adult concept imposed on children, who are adept at imitating their elders. However, if they can be kept off the stage until they reach teenage, and are given regular work in creative drama all through their early school years, children experience the best pos- sible preparation for formal drama. They have an under- standing of character, the ability to think creatively in improvising dialogue and action, they have control of their speech and their bodies-in other words, they acquire the basic techniques of the actor. Wise educators should there- fore be willing to sacrifice the spectacle of children imitat- ing adults, showing off on stage and reciting lines which they do not fully understand, for the deeper values of personality development and true understanding of dra- ma which creative drama can give. In addition to the development of imagination and crea- tive thinking suggested above, these arts can be of great help to teachers of geography, history, science, health and social sciences if they are properly used. They offer a method of 'learning by doing', rather than by memoriza- tion. Children who are skilfully guided to produce a puppet show or a creative drama about the life of people in another country not only learn about that country, but are likely to have their curiosity aroused so that they will seek to know more about it on their own. 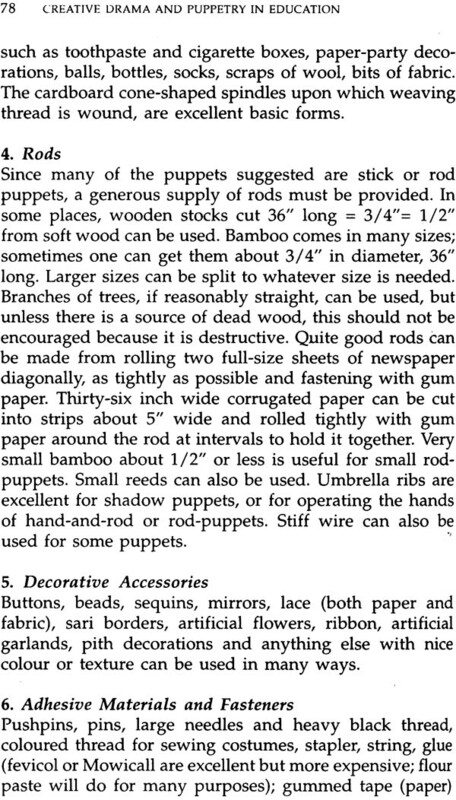 Just as in the case noted above where there is 'commu- nication of ideas' to children, so also there can be effective use of puppets for communicating ideas to adults, espe- cially in the villages. 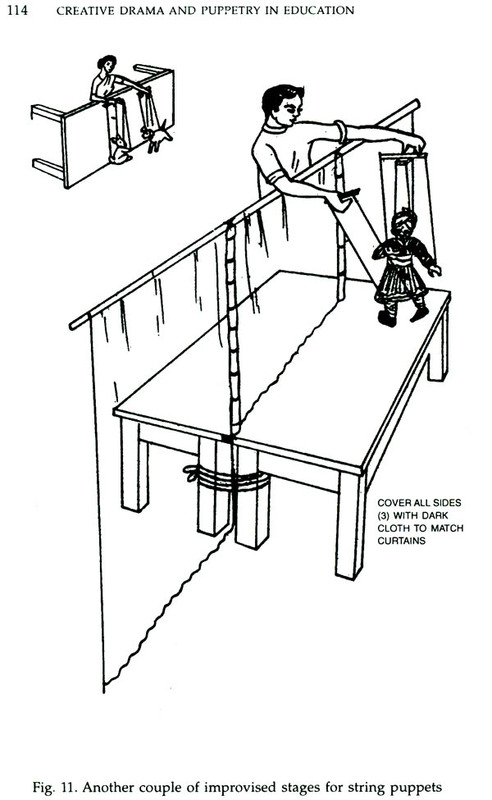 Thus, puppetry becomes a valuable 'visual aid', but only if the message to be communicated is developed in dramatic terms (as will be explained, later in this outline). Otherwise there is danger of having the puppets just talk on and on-as human beings so often do! The arts in recreation are as yet undeveloped in India, except in a few places such as the Bal Bhavans in the country. Both in the poorer sections of the cities and in the villages, there is very little for children to do for entertain- ment. The more they can be helped to do things with their own hands which are an expression of their own ideas and not copied from designs given to them, the better they will be as individuals. 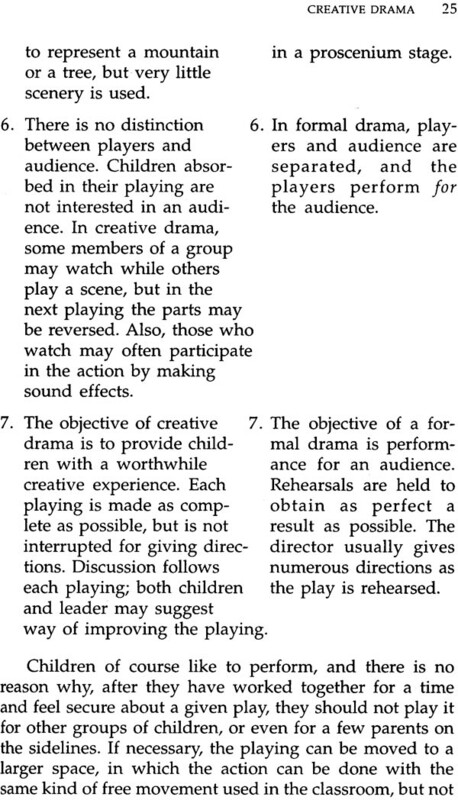 Creative drama is an excellent art for recreation. As yet, there are few people trained for it, but eventually, if some of the social workers in the villages, and the teachers, can be given even the rudiments of how to use the arts creatively, a good deal could be done. In occupational therapy, various arts are of value, some as entertainment for hospitalized children, others as exer- cise for crippled limbs. As far as possible, some stimulation of the imagination is desirable. Being a specialized field, this must be done carefully under medical guidance. It is, however, mentioned here because both puppetry and creative drama have often added interest to therapy pro- grammes. India offers a great potential for the development of all the creative arts, as more people are trained in their use, and more awareness of their value develops. 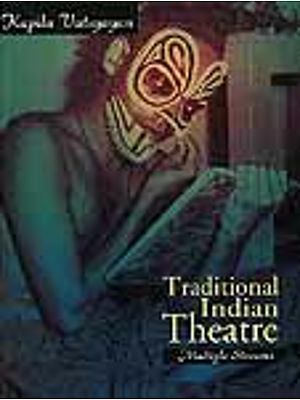 My grateful thanks go to Dr. (Mrs.) Marjorie Mcpharlin of Santa Fe, U.S.A., an authority on Red Indian Folk Art and Puppetry in Education, without whose co-operation, encouragement and assistance this book would not have materialized. I am assistance this book would not have materialized. I am indeed greatly indebted to her, whom I consider my Guru for her unstinting assistance and experiences shared with me. I must also thank my daughter-in-law rashida and son Navroze for all their assistance in designing the layout and redoing all the photographs and sketches for the book in spite of all their busy work schedules.